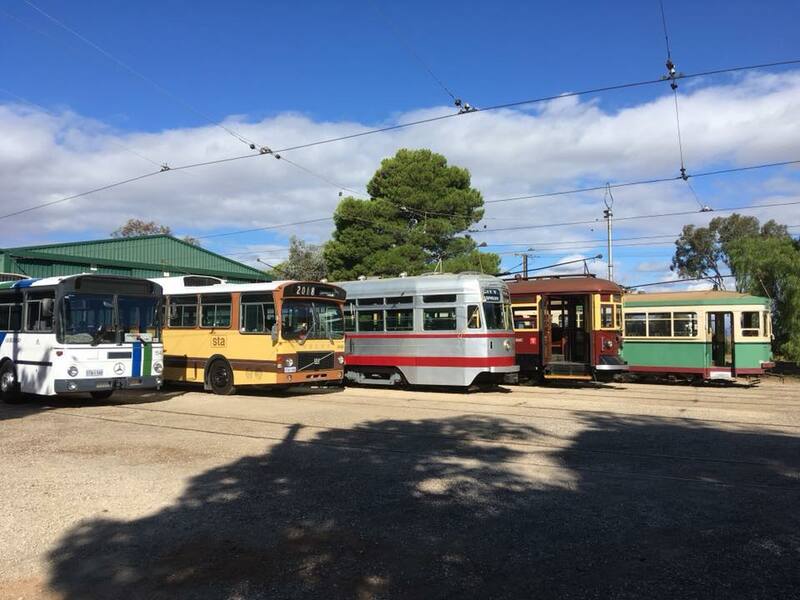 Museum collection started off with just four trams in 1958 with a fifth arriving in 1959, the Museum has collected and restored a number of trams from not just Adelaide but from several other Australian States to show the progression of tramcar development over the years. Today, the Museum now has 26 trams, a horse box, 4 trolley buses, 2 horse trams and a diesel bus that followed the electric trams. Our collection is stored in five buildings. Below is a comprehensive list of our extensive collection. Horse tram 15 makes an interesting exhibit at the Museum. It has not been restored and therefore when displayed next to horse tram 18 makes an interesting ‘before and after restoration’ comparison. The tram was built for the Adelaide, Unley and Mitcham Tramway Co. which opened its service on 12 February 1879. Most Adelaide horse trams had a back-to-back (‘knifeboard’) upstairs seats, but this car was one of a small number that had transverse ‘tip-over’ seats. It was built locally by Duncan and Fraser. After the horse trams were replaced, most were sold. Car 15 served for many years as a ‘summer house’ in a garden at Fowlers Road, Glenunga. A corrugated iron roof protected the main body section from the weather for 60 years. Some original signage can still be seen on the tram. The body of horse car 15 was donated to the Museum in the 1990s. Adelaide had an extensive horse tram system which commenced in June 1878 with a line from the City to Kensington. Several private companies operated these services over a system of more than 50 miles (80km). The Adelaide & Suburban Tramway Co. had a fleet of 90 cars requiring 650 horses. As well as the city based system there were isolated lines from Glenelg to Brighton and Albert Park to Port Adelaide. When the MTT (Municipal Tramways Trust) was set up in 1907 it took over the horse tram services with a fleet of 163 cars. Horse trams disappeared from suburban streets by 1914. Adelaide and Suburban Tramway Co. horse car 18 was among the first cars ordered from John Stephenson and Company, New York, to open Adelaide's horse tram services in 1878. It appears to have originally been a single deck car as it has only a small number of ventilator lights in the centre of the saloon roof. This is corroborated by photographs. It was later converted to a double decker by the Company in its own workshops at Kensington. After closure, horse tram 18 was used for 50 years as a playroom and fern house at Walkerville Terrace, Walkerville. 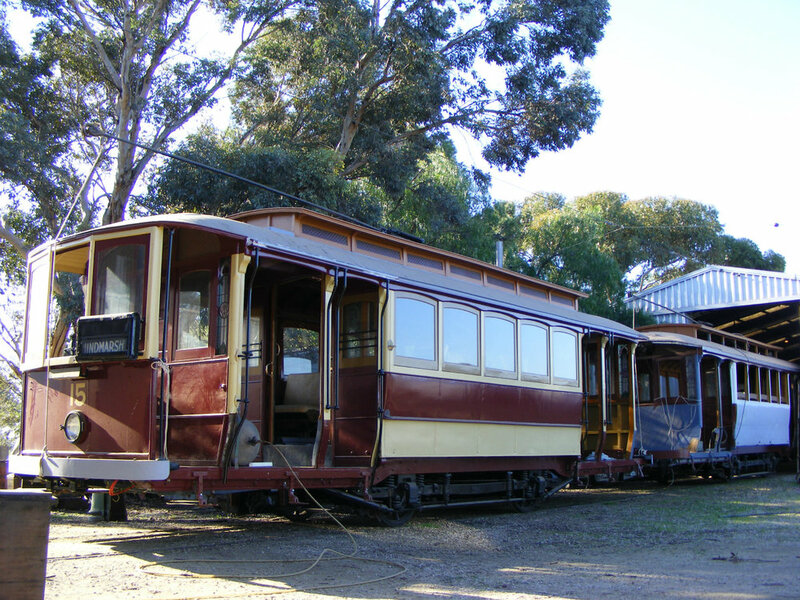 The tram was acquired by the National Trust in the 1960s and was restored by staff of the South Australian Housing Trust before being stored at the old Maylands horse tram depot. It was transferred to St. Kilda in 1971and later placed on display. In 1978 horse tram 18 was repainted in its traditional colours by students and staff of the Marleston TAFE College for the Centenary of Street Transport celebration in June 1978. In 1988 the National Trust displayed and stored the tram elsewhere before returning it to the Museum for display in 2001. 100 electric trams were built in 1908-9 for the Municipal Tramways Trust (MTT) to open Adelaide's electric tram system. 70 of these trams were of the single truck Combination style (central saloon and open ends) and were numbered 1 to 30 and 61 to 100. In the 1920s these trams were classified Type A Trams. The open cross-bench seats at either end combined with the centre saloon seated a total of forty persons. A further sixty persons could be carried standing, making a ‘crush load’ of one hundred. On March 9th 1909, Tram No. 1 led the inaugural procession of cars to Kensington, marking the official opening of Adelaide’s Electric Tramway system. These small trams served well to help establish the services over the first two years, as the inner Adelaide sections of the lines were opened up to Kensington, Marryatville, Maylands, Payneham, Walkerville, North Adelaide, Parkside, Unley and Hyde Park. In later years, the A type cars were used on quiet services to Croydon and Pt. Adelaide. By the 1930s as larger trams became available many of them were retired to storage. After a second life in service as part of a coupled set No. 1 was retained as a shunter at Hackney Depot and was delivered to the St Kilda Museum site on 9 August 1958. During the WWII many A-Types had been placed into storage but they were pressed into service once again and coupled in pairs, nicknamed Bib & Bub to help carry very heavy passenger loadings during the war. From 1941 to 1950, Tram No. 1 being coupled to Tram No. 2 and so on. 58 A-Types and 4 A1-Types were permanently coupled to conserve manpower during a period when many tramways staff had enlisted in the armed services. These trams were known as Bib & Bub after well known bushland comic characters created by May Gibbs. Operation of Bib & Bub sets continued until 30 November 1950. The Museum is reconstructing the bodies of trams 14 and 15 for eventual use as a Bib & Bub set. Included in the original order of 100 trams were 30 open cross bench trams (31 - 60). Nicknamed Toastracks because of their resemblance to breakfast table toast racks. The ‘toast-racks’ were popular for summer beach traffic and the Tramways Band was carried in these open cars to Henley, Semaphore or Kensington Gardens to perform concerts at the bandstands built by the MTT. Concerts by the renowned MTT band were popular entertainment and carrying concertgoers to and from the concerts added handsomely to MTT revenue. The MTT band concerts at Semaphore were abandoned when it was realised that many concertgoers travelled there by train. The Toastracks were however unpopular with both crews and the public during inclement weather resulting in 20 cars being converted to combination trams in 1917 (cars 44 - 60 designated A1-Type Trams and No. 41 - 43 designated A2-Types Trams). When building the Glenelg line in 1929 one of these unpopular cars was converted to assist with track work (In tram terms called the permanent way). Tram No. 42 was rebuilt in 1917 with straight sided centre saloons with three large windows (A2-Type) and operated on the isolated Port Adelaide system until it closed in 1935. It was retained at Hackney Depot as a store until donated to the Museum in 1958. Car 42 has been reconstructed at the Museum to its original Toastrack configuration and returned to service in 1994. 70 larger combination trams were built from 1910-12 for the expansion of the electric tramway system. They had a saloon at one end and cross bench seats at the other capabale of seating 54 passangers. These trams sat on two maximum traction bogies (small pony guide wheel and a larger driving wheel). They were often hired to take picnic parties to Magill or Burnside at a charge of 24 shillings for the whole group. The E-Type trams were all converted to the E1-Type Saloon Bogie in 1936. The body of 118 arrived at St Kilda in 1982 after residing at Fishermans Bay near Port Broughton for about 25 years. It has been reconstructed to the original bogie combination style. E-Type No. 118 was officially launched on 23 May 2010 by Deputy Premier of SA Kevin Foley in conjunction with Margaret Anderson Director of History SA. History SA provided initial funding of $19,000 for the restoration of No. 118. Initial restoration work focused on dismantling the saloon at the crossbench end and strengthening the frame and restoration of the remaining saloon interior. The bulk of the work occurred over the five years prior to May 2010 mainly due to the generous donations of members who donated over $64,000 to the project. The E1-Type Saloon Bogie trams were all rebuilt from the E-Type trams in 1936. The rebuilding involved the removal of the crossbench seats and extension of the saloon for the length of the car. The new saloons received the wooden seats from the original saloons and specially imported English moquette upholstory on foam rubber cushions was fitted in the original saloons (the non smoking compartments). No. 101 was repainted ivory and gold in 1936 and temporarily renumbered No. 100 for the South Australian Centenary Celebrations. The ‘E-Type trams were used mostly on the Glen Osmond - St Peters route. The 50 D-Type trams (121 - 170) had sliding doors fitted along the sides of the crossbench end, giving much greater protection to passengers in inclement weather. When the D-Types entered service they were the largest public transport vehicles in the streets and could carry 54 passengers seated with standing room for a further 100. In 1912 four similar cars were built in Adelaide for the Prahran & Malvern Tramways Trust in Melbourne. They were subsequently sold to the Hawthorn Tramways Trust. In 1922 they became Melbourne and Metropolitan Tramways Board 127 - 130. They were acquired in 1927 by the MTT in Adelaide Trams 191 - 194. By 1934 a centre aisle was cut through the centre bulkhead and four of the six crossbench seats of Trams No. 121 - 170 following a number of accidents to conductors collecting fares from the footboards. Trams 191 - 194 had the aisle cut through five of the six crossbench seats prior to their purchase. In their later years, the D-Type trams became a common sight on the tram lines serving the South Eastern suburbs of Erindale, Burnside, Linden Park, Kingswood. The D-Type trams were last used on 5 March 1958. Car 192 (formerly M&MTB No. 130) was one of the first cars at the Museum site in 1958. Refurbishment of the tram was completed in May 1979. During the First World War the MTT urgently needed more tramcars because of passenger traffic generated by line extensions and the isolated Port Adelaide system. Wartime conditions made it hard to obtain equipment, so twenty tram cars similar to the seventy type A trams were built by Duncan & Fraser. They looked very modern because of the simple arched roof, but this was simply a cost saving measure, not a design feature. Like the A-Types they were modelled on, they seated forty passengers and carried a further sixty-two standees. These trams worked mostly on the Croydon-Keswick service but were also used on the Port Adelaide system in the early 1930’s. Larger motors made them faster and they soon became known as ‘Desert Gold’ trams after a New Zealand racehorse which had a number of wins in Australia at the time. Their speed was subsequently utilised in competition with the unlicenced private buses which began plying on the tram routes in the early 1920s. They continued to be used in peak traffic until 1952 and last saw service during the royal visit of 1954. In later years, by then popularly called “Bouncing Billies”, the C-Types became notorious for having no air brakes. 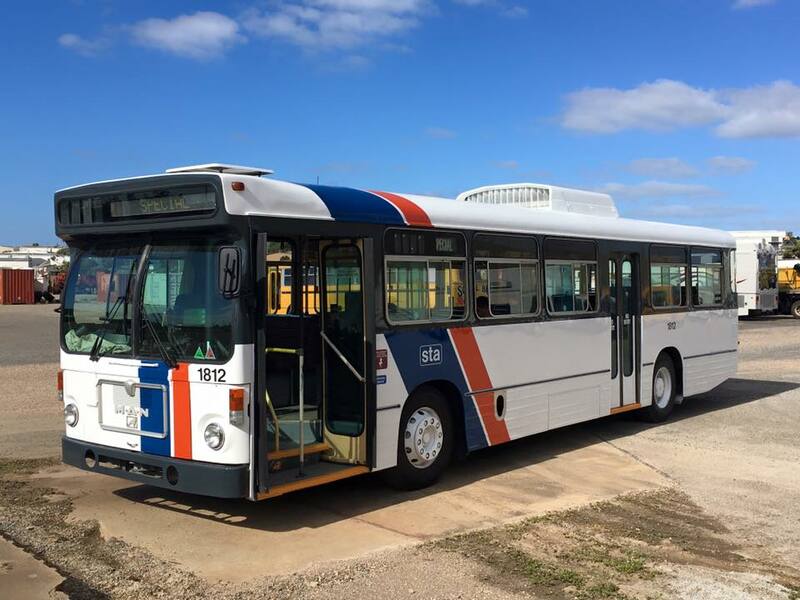 The MTT drivers once went out on strike over safety concerns. The body of 186 was retrieved from Woodlands school at Glenelg in 1983 where it had been used as a playroom for the junior school. The tram has been extensively rebuilt and was officially launched in March 1989. The F-Type/F1-Type Drop-centre trams were a highly successful design offering generous space and comfort. More modern running gear taking up less space meant that the car body was lower to the ground, making the tram easier to board. Six feet (180 cm) longer than the earlier D-Type and E-Type Trams. The F’s had 60 seats with space for a further 110 Standees. Six streams of passengers could board simultaneously. Their large capacity and superior riding qualities made them popular with the public. The Drop-centres were used over most of the tramway system and were especially suitable for heavy traffic like Horse Races, Football Games, the Royal Adelaide Show and beach outings. 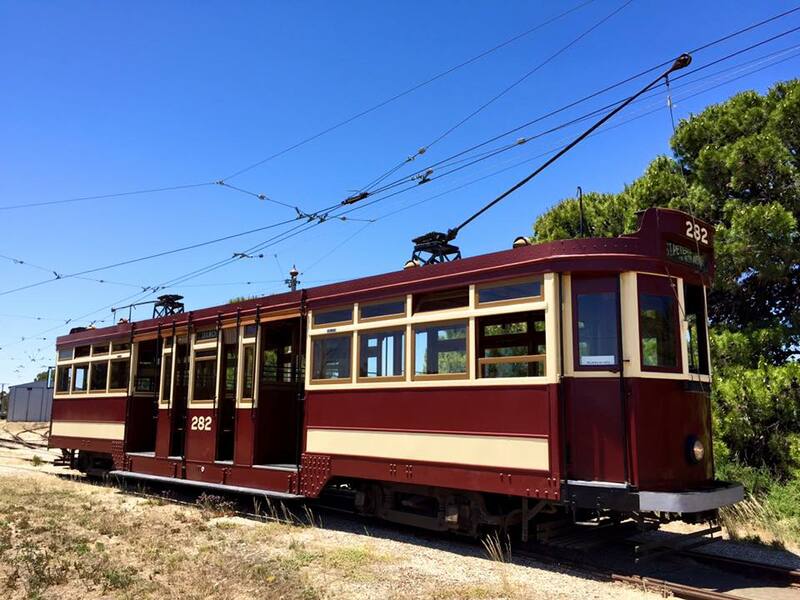 81 cars were built by Pengelley & Co and three were built in the MTT’s own workshops during the 1920s bringing the total up to 84 F/F1-Types, the most of any type of tram in Adelaide. 50 cars were repainted in the early 1950s in silver and carnation red to give a more modern appearance. The interiors were painted in Asbury green. They were last used upon the closure of the Adelaide street tramway system on 22 November 1958. 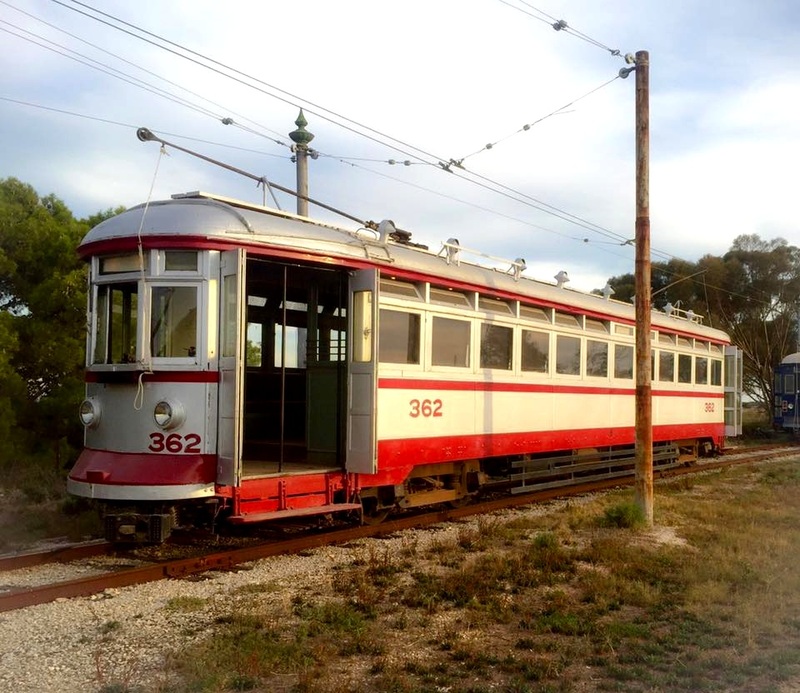 Car 264 was used as a sleepout on a farm at Clare SA until retrieved in 1981 and reconstructed by 1986 using ex Melbourne ‘W2’ class tram bogies and electrical equipment. F1-Type No. 282 arrived at St Kilda in 1959. Restoration commenced in 1968 and the tram was ready for the opening of the Museum Tram Line in 1974. G-Type trams also known as Birney Safety (named after their designer, Charles Birney) were built by J.G. Brill and Co. of Philadelphia USA in 1924 and entered service in Adelaide in 1925. Seating 32 passengers the G-Type trams were known mostly to patrons using the small, self-contained system radiating out from the Black Diamond corner at Port Adelaide to Semaphore, Largs, Rosewater, and Albert Park. These lines did not connect to the rest of the Adelaide system and tram service ran for eighteen years before being replaced by buses and trolley buses which ran from the City along Port Road. The four G-Type trams were exported to Australia and assembled in the MTT workshops and made up the smallest group of MTT trams with the shortest running life of only 10 years service. They were also the shortest cars operated by the MTT. Following the closure of the Port Adelaide tramway in 1935 they were sold for use at Geelong and become Geelong No. 30, 29, 27 & 28. They were transferred to the Bendigo system in 1947. No. 27 (ex 303) was badly damaged in an accident in 1956 and sold to a farmer near Maryborough, Victoria. The other three Birneys remained and are now operated by the Bendigo Tramways. Th Bendigo Trust obtained the body of 27 in 1975 and reconstructed it as Port Adelaide 303 using original mechanical components. The interior seating which had been sold to a local Bendigo resident was also obtained and reinstalled in the tram during its restoration. No. 303 entered service at St Kilda in August 1976. H-Type Trams (Commonly referred to as Glenelg Trams) No. 351 - 380 were built in 1929 specifically for the Glenelg tram line which commenced on 14 December 1929. They were large bogie end loading saloons and were classified as H-Type Trams. They could run in coupled sets, have power operated doors, folding steps and reversible leather seats. They were also used on the Henley North line from 1935 and then through to Kensington Gardens after these lines were through routed in 1952. All H-Types were repainted in the silver and carnation red livery between 1952 and 1956. They were progressively refurbished from 1971 and returned to the Tuscan red livery. When operations were transferred from the Angas Street City Depot to Glengowrie depot in September 1986, pantographs replaced trolley poles for current collection. Trams No. 360 and 362 were not refurbished and arrived at St Kilda in 1982. Tram No. 362 was repainted in the silver and carnation red livery and entered limited museum service in 1983. No. 360 was refurbished to its original form in 1999 for the 70th anniversary of the Glenelg line and the H-Types. 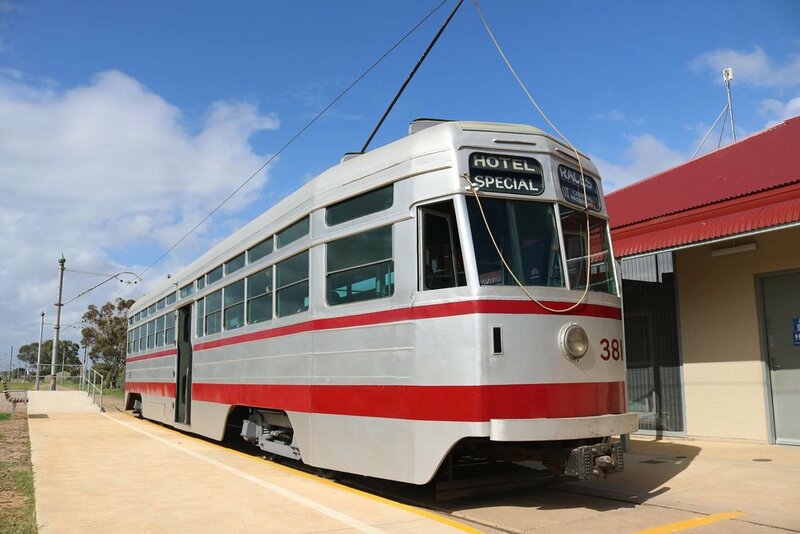 When the State Government called for tenders for the 16 remaining H-Types in 2005 which were being replaced by the modern Flexity tramcars, the Museum decided that Glenelg tram 364 would make an excellent addition to our existing H-Type trams at the Museum. No. 364 represents the 1980s style refurbishment of these trams and differs in several ways from our other H-Types. In December 2005 H-Type No. 365 was delivered to the Museum for storage on behalf of its owner who intended to turn it into a 'Bed & Breakfast' in the Adelaide Hills. As No. 365 was one of the ten operational 1980s refurbished H cars being disposed of, it had been planned for the Museum to strip the tram for useful parts before the owner took the body away. The Museum's own 1980s refurbished H-Type No. 364 arrived in October 2006. 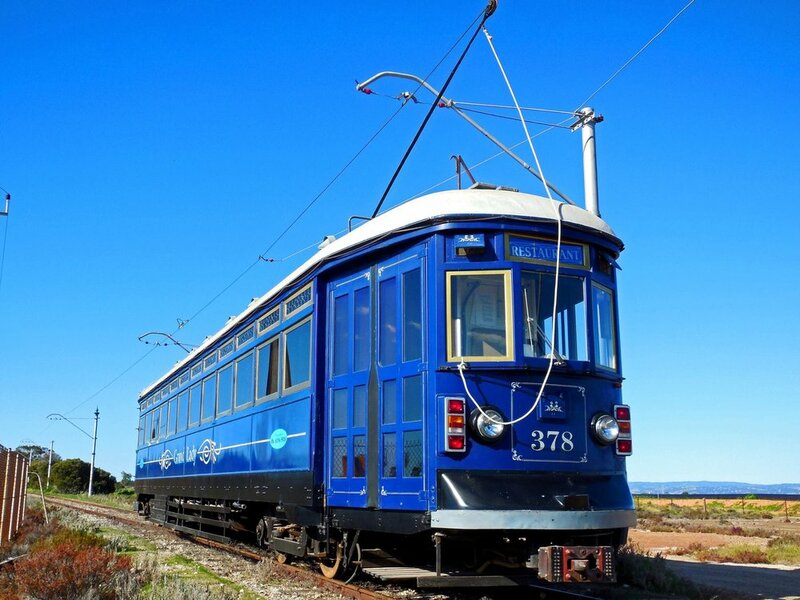 The owner's plans for the tram did not go ahead and the tram was purchased by the Museum and on sold to a Museum member who resotred it to running condition in the 1980-90s STA (State Transport Authority) Livery. A one off unique H-Type is No. 378 which was turned into a restaurant on rails for use on the Glenelg Line. It was launched by the Premier John Bannonon 1 November 1990. Tram No. 378 ran for 2-3 years with pre-cooked meals. It operated as the Adelaide Tramcar Restaurant and featured a range of food options from elaborate three course dinners to simple afternoon teas. No. 378 generally ran up to 6 times a day. The tram is a mechanically similar to the 1980s refurbished H-Types, but fitted with vigilance controls to allow its operation by one tramway staff member, It normally operated at series speed only to lengthen the journey and minimise the impact of any track imperfections. Unfortunately the enterprise was not financially viable at that time and went into bankruptcy. A couple of years later TransAdelaide attempted to revive the business by renaming the tram The Grand Lady with meals pre-cooked by the Grand Hotel at Glenelg but without much success. The tram was handed over to the History Trust of SA and arrived at St Kilda for storage and display in June 2007. It makes a visually different exhibit on Display at the Musuem. H1-Type No. 381 was the first of a projected order of 40 cars planned in 1939. However the first tram was not built until 1952 when a tramway abandonment policy resulted in the cancellation of the remaining cars. The body was all steel and it was fitted with power operated doors. Four destination blinds were fitted to each end of the car, a style which was later used on the replacement buses. The interior was painted asbury green & cream and fitted with fixed bus seats. It was designated H1-Type. No. 381 entered regular service on the Henley North - Kensington Gardens line on 19 February 1953. It was withdrawn from service in December 1957 and stored. No. 381 has had a much more successful record at the Museum. It was donated to the Museum and arrived on site on 13 August 1965. It became the 6th tram to enter service at the Museum entering service in July 1974 - 4 months after the official opening. On occasion the Museum has had some visitors in the form of privately owned restored/preserved Heritage Buses from South Australia’s past.